Wow, now that’s customer service, but were we pleased with what we got?? Their top selling soup was a coconut chicken soup. It caught my eye immediately and then he secured my decision. 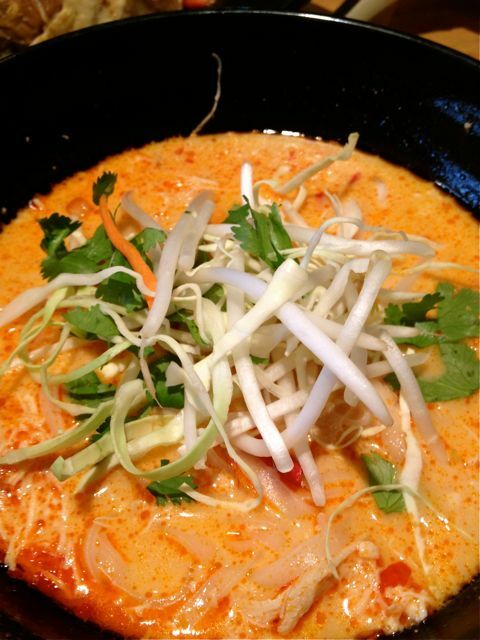 This soup is light on the coconut and heavy on the chicken with a little bit of shrimp running through it. It was a perfect balance of everything. I also liked that it wasn’t a heavy soup. Two of us shared this bowl and it was more than enough….well that’s because we ordered even more stuff. The Sesame Beef was also very tasty. 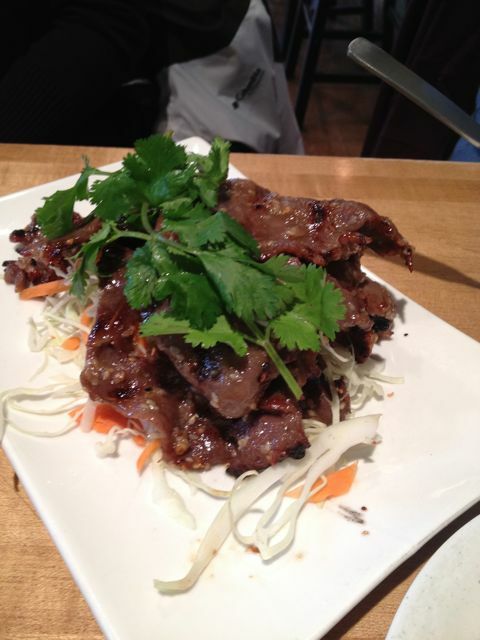 It was very thinly sliced and placed atop shredded cabbage and served with sticky rice. The beef was flavored well, not too strong. I like my beef you know. We were headed towards the wide noodle pasta, but after we told him that we wanted lots of veggies he told us to order the glass noodles. I wish I could remember the exact name of this dish. So sorry. It’s not on the menu, it was on a separate board with about 6-7 other dishes. It was by far my favorite dish. I want to stop writing this review right now and go get another plate. The noodles were made with a bean making them healthy and they were slightly sweetened. 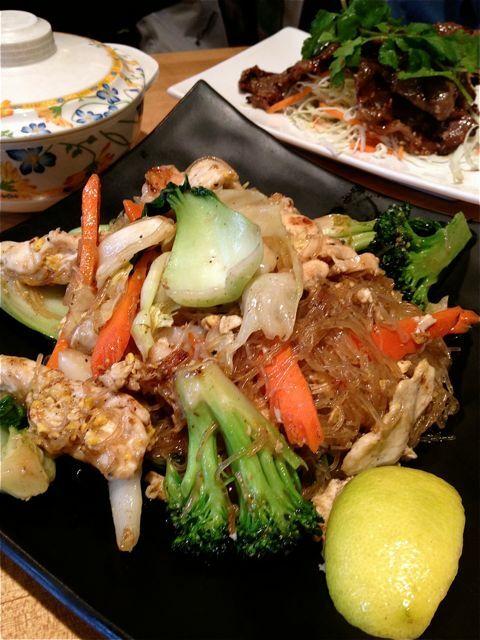 Not as sweet as a pad thai. There were tons of veggies running through it, carrots, bok choy, cabbage and broccoli. There was also some chicken and a little bit of shrimp. Best dish we ordered in my opinion. As you also know I am a tea lover. This place had tons of teas. They had a rack of teapots hanging, so you could tell this was the place. Believe it or not, I didn’t order any tea. Next time for sure. 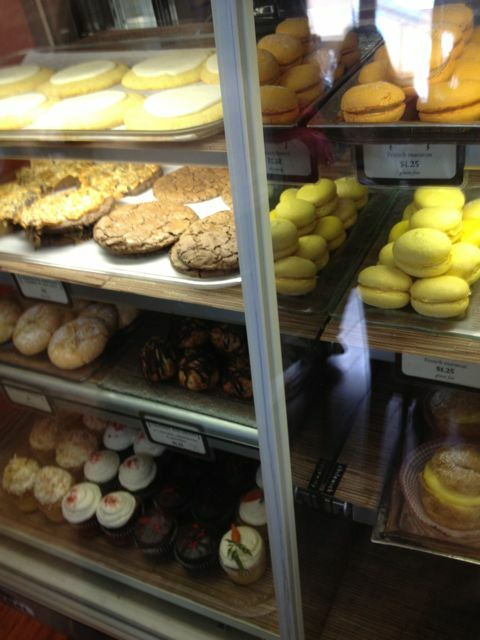 There were also tons of desserts that we didn’t try. I will definitely be making my way back to this place as it has made my favorites list. Atmosphere was cute, bright and open. There people getting dessert only, others meeting friends and lots of families on this sunny Saturday. Pricing was really reasonable for what you get. The 3 of us ordered 3 entrees and it was $30 and we took home 2 boxes of left overs. Service was great from the help to ordering all the way to the sign that told us what to do. I sure appreciated that big sign that told you how to order, not to grab a seat until after you ordered and to not bus your own tables. They are a teahouse, so tons of loose leaf tea. They also had beer and wine. 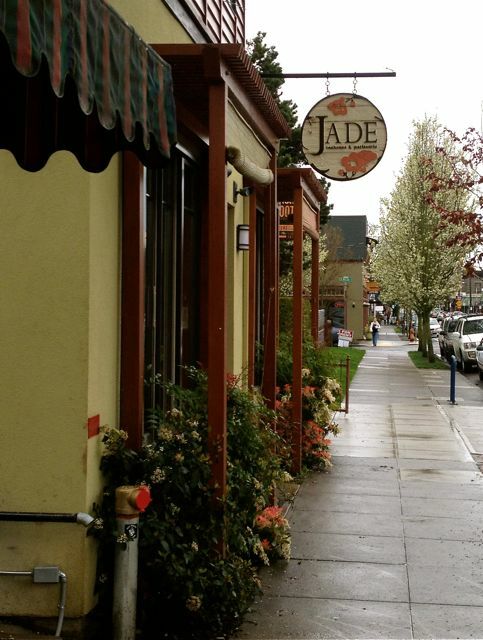 Jade Teahouse is located in Sellwood.